For the most part the book does a good job with vocabulary. L’Engle mostly uses words that 8-12 year olds would know, with some more obscure words sprinkled in that they’ll be able to pick up from context (wraithlike, uncanny), and that’s just how kids like it. And Meg talks believably like a 12 year old. As I said when I discussed the movie, Charles Wallace is trickier. We’re told that he didn’t speak at all until he was four, but he’s now five and he’s caught up quickly, talking in a very advanced way for his age. This wasn’t believable at all onscreen, but is it believable on the page? Eh, close enough. 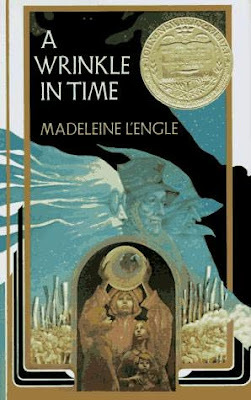 It feels a little convenient for L’Engle to have a five-year-old co-hero who isn’t limited to how a five-year-old would actually talk, but we go along with it. Now that I’ve pointed this out to you, you will see it all the damn time. And I never buy it. That’s not the way we use vocabulary. By the time we feel comfortable enough with a word to use it in conversation, we’ve forgotten when and where we learned it and just feel like we’ve always known it. L’Engle got away with it in 1962, but don’t try to get away with this in 2019! We see what you’re trying to get away with. Believe me when I say that often the editors introduce the typos themselves. That drove me nuts as a kid. The only time I've ever seen this pulled off even moderately well is in A Series of Unfortunate Events, where explanations of complicated words are so frequent as to be a running joke. Also, the definitions are often...colorful.